Seattle Superstorm (2012) - Sci-fi-central.com. USA  2012  88m   Directed by: Jason Bourque.  Starring: Esai Morales, Ona Grauer, Jared Abrahamson, MacKenzie Porter, Martin Cummins, Michelle Harrison, Jay Brazeau, Thomas Bradshaw, Jon Johnson, Owen Kwong, Brenda Crichlow, Jim Sced, Matty Finochio.  Music by: Michael Neilson. Over the years disaster movies have found a fan base like you wouldn't believe. Most of them are a bit cheesy and make little to no sense, but still manage to attract stars as well as fans. The latest Seattle Superstorm stars Esai Morales with a title that pretty much speaks for itself, but is the forecast for disaster worth the time? Seattle Superstorm follows a NASA scientist and Navy Lieutenant fighting to solve the mystery of strange weather phenomena causing earthquakes, tornados, and lightning storms that's threatening to destroy the entire city. Much like most of these films, this one plays like a Syfy Channel film with all the cheese and ridiculousness as expected. Here though they opted out of going to silly and attempted to keep it somewhat serious and it actually works on some level. The story is simple with a lot of aspects being a bit too convenient but not all that surprising. The effects are the usual low budget effects, but most of them work pretty well. The filmmakers clearly tried to get some tone and sense of urgency to this film that comes across well enough, which is something that is usually lacking in these films. This film deserves credit for really trying to create a good movie, which goes along way despite budget. Obviously these films are geared towards a specific audience, that loves these low budget cheesy flicks and they are sure to be entertained. There are sure to be those that love it and cannot wait to add it to their collection, but if you don't normally check these kinds of films out you will most likely be disappointed. Seattle Superstorm: Review of the DVD Video. Seattle Superstorm (2012) - movie review. 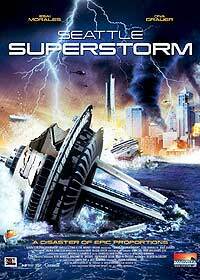 -�Seattle Superstorm' TV Review of a Syfy Saturday Night Movie. Seattle Superstorm (2012/DVD/ Arc Entertainment) Review.